FAST FOWARD, NICARAGUA FROM 1999 TO 2005 WAS LIKE WINNING THE DESIGN LOTTERY. ROGER AND I DID ABOUT 45 PROJECTS. MOST OF THEM ENDED UP IN THE PORTFOLIO UNBUILT, BUT FOUR IMPORTANT PROJECTS FOR THE GOVERNMENT DID GET BUILT. LANDMARKS THAT THE POPULOUS RECOGNIZE AND DO NOT FORGET THAT EXIST TODAY. WHEN I WOULD GO INTO A RESTAURANT THERE WOULD BE AN ACKNOWLEDGEMENT, ARCHITECT GLEN SMALL IS HERE TONIGHT. NOW THAT IS PLEASANT TO HEAR. WE ALL WANT TO BE RECOGNIZED AND RESPECTED. THEY SAY AFTER THE BASICS HAVE BEEN MET OF FOOD, HOUSING, MEDICAL ETC., THE NEXT THING ONE NEEDS IS RECOGNITION. MY FAVORITE HANG OUT WAS MARIA BONITA WHERE FOOD, CHATTER, MUSIC AND POWER MIXED. SOCIETY HAS A TON OF AWARDS, BEST BOWLER, BEST WRITER, BEST ACTOR, BEST CONTRACTOR, BEST DOCTOR, BEST POLITICIAN, BEST SOLDIER, BEST DANCER, BEST FRIEND, ETC. ACCOMPLISHMENTS NEED APPLAUSE. THE ARCHITECTURAL PROFESSION HAS A BUNCH OF AWARDS. AIA LOCAL, STATE AND NATIONAL. THERE ARE FAIA AND GOLD METAL ETC. I HAVE NEVER GOT ANY, SO I AM SUSPECT AS TO HOW THIS ALL WORKS. GIVING PATS ON THE BACK TO ADVANCE ONE’S COMMERCIAL CAREER. YOU HAVE TO ENTER BY PUTTING UP MONEY AND DOING EXPENSIVE PRESENTATIONS, JUDGED BY ARCHITECTS WHO ARE PART OF THE PACK OF THE UPWARDLY MOBILE IN CROWD. IN NICARAGUA IT DID NOT MATTER, I WAS GIVEN PROJECTS FOR MY DESIGN ABILITY. 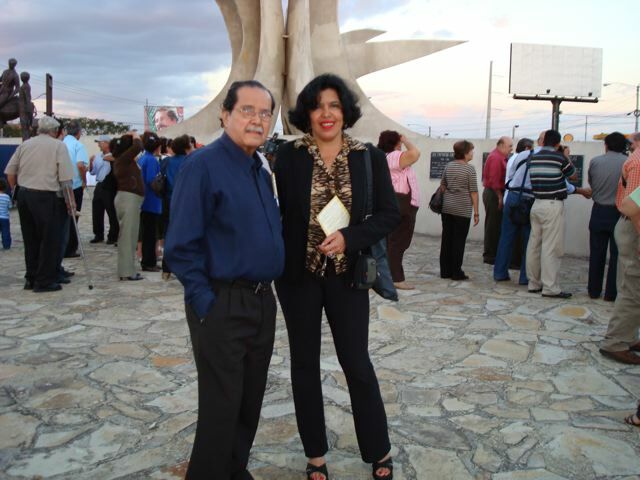 HERTY LEWITES MY CLIENT WHO I HAD KNOWN SINCE 1985 AS THE MINISTER OF TOURISM UNDER ORTEGA, ROSE TO POWER BY WINNING THE ELECTIONS IN 2000 FOR MAYOR OF MANAGUA NICARAGUA. HERTY WAS A POLITICAL ANIMAL, BUT WAS RELAXED WITH A QUICK WIT AND WAS FUNNY. HIS STATURE WAS NON THREATENING. HE HAD A TWINKLE IN HIS EYES AND LIKED TO DANCE. I REMEMBER IN 1985 WHEN I FIRST MEET HIM, HE ADAMANTLY CONVEYED TO ME, HE HAD POWER. I HAD NEVER BEEN CLOSE TO POWER OTHER THAN WITH THE GREEN MACHINE BACKING OF CALVIN HAMILTON, THE HEAD OF PLANNING FOR LOS ANGELES. HE HAD DIED WITHOUT ANY PROFESSIONAL RECOGNITION. A SAD COMMENTARY ON POWER FORGOTTEN. HERTY WAS CONSTANTLY MEETING SOMEONE THAT WANTED SOMETHING. WE DID A BUS STATION, RESTAURANT ON LAKE MANAGUA, MUSEUM IN THE RUINS, HOTEL ON THE RIVER, BULL RING, SHOPS ON THE LAKE ETC. HE WANTED AN INSTANT DESIGN WITH IMAGES. I WOULD DESIGN THE PROJECT IN A DAY AND DO A COMPUTER COMPOSITE ON THE SITE WITH DAVID CADIE, ROGERS BROTHER THE COMPUTER GRAPHIC EXPERT, SO IN TWO DAYS HERTY COULD SHOW THE PARTY WHAT THEY SHOULD BUILD ALL DEPICTED LIKE REALITY ON THE SITE. YOU CAN IMAGINE HOW IMPRESSIVE THIS MADE HERTY. HERTY MIXED WELL WITH THE CROWDS AND TOOK ON POOR PEOPLE CONCERNS DIRECTLY. HE HAD A HISTORY OF NOT BEING AFRAID AND SPEAKING HIS MIND. HE NEVER SPOKE OF HIS OBJECTIVES ARCHITECTURALLY, BUT I WAS THE DESIGNER FOR THEM. WHAT HAPPENED WAS THAT THE PROJECTS WERE PUT IN PROMINENT EXPOSED PUBLIC SPACES THAT THE POPULOUS COULD INTERACT WITH IN A POSITIVE BENEFICIAL MANNER. I REALIZED AFTER HIS MAYORSHIP WAS COMPLETED THAT HE HAD CREATED AN IMAGE OF A PROGRESSIVE DYNMIC MODERN POPULOUS LEADER HELPED BY JUST THREE MONUMENT STRUCTURES I HAD DESIGNED. IT WAS A SIMPLE FORMULA. THERE WERE INTEREST GROUPS THAT WANTED TO BE CLOSE TO POWER. HERTY HAD POWER. THE INTEREST GROUPS WOULD CONTRIBUTE TO CIVIC PROJECTS. THE TAIWANESE PUT MONEY UP FOR THE BOLIVAR PLAZA ROTUNDA FOUNTAIN, THEY ALSO PUT UP MONEY FOR THE ACOUSTICAL SHELL. THE JOURNALISTS WANTED A PLAZA ROTUNDA AS TRIBUTE TO THE JOURNALISTS OF THE PAST AND A PLACE TO HOLD GATHERINGS. I CAN NOT SAY WHAT WAS THE DEALINGS, BECAUSE AT NO TIME WAS I PRIVY TO THESE MATTERS. BUT HERTY WAS AT EASE WHEELING AND DEALING AND MAKING THESE PROJECTS HAPPEN TO MAKE PEOPLE HAPPY. THE PROJECTS WERE STAGE SETS. NOT YOUR CAST IN PLACE CONCRETE MONUMENTS FOREVER. THEY WERE LIGHT STEEL FRAMES WITH SOME TYPE OF CONCRETE COATING. IN THE STATES IT WOULD HAVE BEEN STUCCO, BUT REGRETFULLY LIGHT WEIGHT CONCRETE COMPOSITE BOARDS WERE USED ON THREE OF THE PROJECTS. I DEMANDED AND GOT A HEAVY CONCRETE COATING OVER PERFORATED STEEL FOR SKINNING THE ACOUSTICAL SHELL. THE COST WAS EXTREMELY INEXPENSIVE THE WAY THESE PROJECTS WERE BUILT. LABOR WAS CHEAP, THE MATERIALS REASONABLE, AND THERE WAS MINIMUM USE OF MACHINES. FOR THE JOURNALIST ROTUNDA BUDGET I VAGUELY REMEMBER IT BEING JUST OVER US$100,000 FOR CONSTRUCTION AND MATERIALS. ARCHITECTS ONLY RELATE TO PERFECT CONSTRUCTION AND COMPLICATED DETAILS. I THINK PRAISE SHOULD BE GIVEN FOR BUILDING CHEAP WITH ALL THE LOCAL LIMITATIONS OF PERFECTION. ARCHITECTS STAY AWAY FROM THIS, BECAUSE NO SUBSTANTIAL MONEY CAN BE MADE AND SLICK IS THE FUSSY WORLD OF JUDGMENTAL ARCHITECTS. AFTER HERTY LEFT HIS MAYORSHIP THE PROJECTS BEGGED FOR THE SIMPLEST OF UPKEEP AND WERE ROBBED OF MECHANIZED PARTS AND LIGHTING. HERTY RAN AGAINST DANIEL ORTEGA IN THE 2005 ELECTION FOR PRESIDENT. HE WAS DOING WELL CAMPAIGNING AND HAD THE BACKING OF A NUMBER OF IMPORTANT SANDINISTAS. HE SUDDENLY DIED TRAGICALLY FROM MEDICAL COMPLICATIONS, MONTHS BEFORE THE ELECTION. 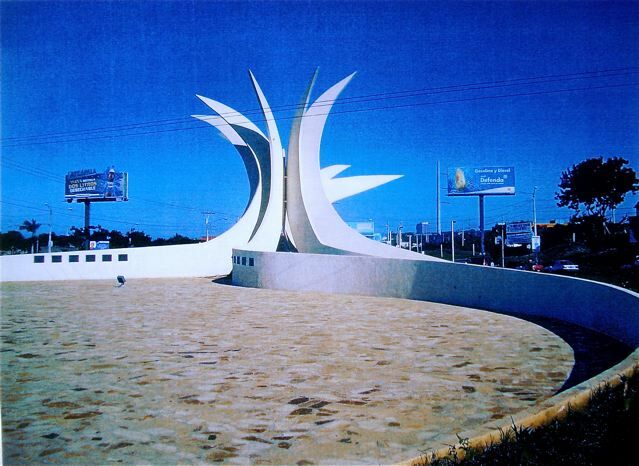 THE JOURNALIST ROTUNDA IN MANAGUA NICARAGUA WAS AN ARCHITECTURAL COMPETITION UNDER THE GUIDANCE OF ARCHITECT AND LAND DEVELOPER MARIO SALINAS, WHO IS NOW THE MINISTER OF TOURISM AND ADVISOR TO THE PRESIDENT DANIEL ORTEGA. MARIO AND I GO BACK TO 1985-1987 WHEN I WORKED WITH HIM DOING THE REMODEL FOR THE INTERCONTINENTAL HOTEL WHICH HERY WANTED EXPANDED. ANOTHER BLOG. MARIO WAS AN ADVISER TO HERTY AND CREATED A LIMITED COMPETITION OF ARCHITECTS TO MAKE PROPOSALS FOR THE JOURNALIST ROTUNDA. THERE WERE FIVE OR SIX ARCHITECTS ASKED TO ENTER THE COMPETITION BUT ONLY ONE ARCHITECT SUBMITTED AN ENTRY BESIDES OURS. WE WON THE COMPETITION. THERE WAS NO HANKY PANKY ABOUT THE JUDGING. HANDS DOWN OUR SCHEME WAS SUPERIOR. AFTER A COUPLE OF BAD IDEAS I CAME UP WITH AN EXPLODING PINEAPPLE TOP FORM WITH PROTRUDING WALLS INTO THE SITE. I LOVE THE LINE IN THE FOUNTAIN HEAD WHERE THE STATEMENT WAS MADE THAT THE DIFFERENCE BETWEEN A GOOD ARCHITECT AND A BAD ARCHITECT IS THAT THE GOOD ARCHITECT THROWS HIS MISTAKES AWAY.THE PROGRAM STATED NINE STATUES WERE TO BE PLACED ON SITE SO THE WALLS ACTED AS FRAMING FOR THE STATUES. THE STATUES NEVER HAPPENED SO THE NINE WALLS COMING TOGETHER WERE JUST THE RESULT OF ABANDONED CRITERIA. THERE WITH A GATHERING PLAZA FOR THE JOURNALIST TO HOLD EVENTS AND TO RECEIVE A STATUE OF THE FIRST JOURNALIST WITH BURRO AND PRINTING PRESS. 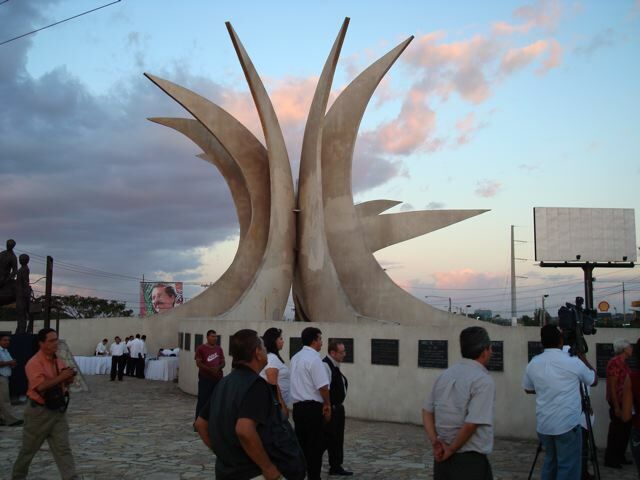 THAT DID HAPPEN ALONG WITH INSCRIPTION PLATES MOUNTED ON THE ENCLOSING WALLS OF THE PLAZA HONORING JOURNALISTS. I WAS NEVER CONSULTED FOR PLACEMENTS OF THESE PLATES, AND FIND THE INSTALLATION DISTURBING, BECAUSE THE PLATES DO STEP WITH THE TAPERED HEIGHT OF THE WALLS. 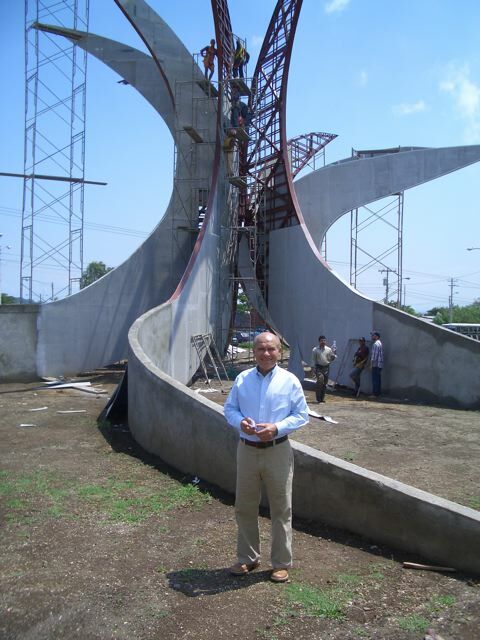 THE ARCHITECTURAL PROCESS WAS DESIGNING A DETAILED PRELIMINARY WITH STRUCTURAL MEMBER LOCATIONS THEN HANDING IT TO SERGIO OBREGON THE ENGINEER, WHO DID THE COMPUTER CALCULATIONS. THESE WERE HANDED TO A COMPUTER DRAFTSMAN WHO CREATED THE CONSTRUCTION DOCUMENTS. THE COMPUTER BEING THE GREAT EQUALIZER. I MARVELED IN NICARAGUA AT THE SHACKS WITH THE MINIMUM OF AMENITIES HAVING A TV THAT BROUGHT THE WORLD TO THE POOR. FROM THE ROAD THESE STRUCTURES WITH NO WINDOWS WOULD BE AGLOW AT NIGHT WITH WORLD COMMUNICATION. THE SAME HELD TRUE FOR COMPUTERS. THE HUMAN MIND APPLIED TO THE COMPUTER SUDDENLY BREAKS ALL CLASS AND EDUCATIONAL BARRIERS TO ALLOW TECHNOLOGY ADVANCEMENT OF SOCIAL POSITION. A DOOR OF A DILAPIDATED BUILDING, WOULD OPEN SHOWING A BUNCH OF COMPUTERS, MAKING A LEVEL PLAYING FIELD OF KNOWLEDGE AND HARD WORK. RICK MATHER, LONDON ARCHITECT AND COLLEGE COLLEAGUE, UPON SEEING THE PINEAPPLE SCHEME CLAIMED AN OSCAR NIEMEYER COPY OF BRASILIA . I REFLECTED ON THAT. OSCAR DID A VERY REGULAR PRECISE OBJECT. MINE WAS A SPIRAL OF VARYING CONFIGURATION THAT GROUNDED OUT IN THE LANDSCAPE WITH LONG EXTENSIONS OF FORMS. ALL RANDOM AND FLOWING IN COMPARISON TO OSCAR. I OBVIOUSLY HAD SEEN OSCARS, BUT IT DID NOT REGISTER IN MY MIND WHEN I WAS DESIGNING THE ASYMMETRICAL NICARAGUA PINEAPPLE TOP. HERTY FAST TRACKED CONSTRUCTION TIME, RESTRICTED THE USE OF CONCRETE FORMING AND DRYING. BUT IN HINDSIGHT, WE SHOULD OF POURED FORMED SECTIONS ON GRADE AND MADE HOOKS TO LIFT THEM INTO PLACE. INSTEAD WE USED STEEL FRAMING AND HARDI BOARD SKINNING. THE CONCRETE COULD HAVE WITHSTOOD THE ABUSE OF TIME THE EXISTING BUILT MONUMENT JUST NEEDS A BIT OF MINOR PATCHING AND PAINTING REGULARLY TO KEEP IT SPARKLING. THE LIGHTING HAS BEEN SHUT OFF. HERTY DEMANDED IMPOSSIBLE DEADLINES TO MOVE PROJECTS FOWARD, IF THE CORRECT DEADLINE WAS FIRM INITIALLY THE PROJECTS WOULD HAVE GOT BETTER QUALITY WORKMANSHIP AND MATERIALS. IT WAS HARD TO GAUGE, AND THE CONTRACTORS WENT CRAZY WITH ORDERS OF TIME DEADLINES FROM THE MAYOR. MANY MISTAKES THAT NEEDED TO BE CORRECTED WERE MET BY YES I WILL CORRECT THAT IN THE FUTURE, KNOWING FULL WELL NOTHING WOULD CHANGE. IT TOOK A WHILE TO GET THE MESSAGE, YES IS EASY TO SAY AND CREATES PEACE FOR THE PRESENT AND FURTHER ALONG IT BECOMES IMPOSSIBLE TO CHANGE. SMART THINKING. MAKING IT PERFECT WAS LIMITED AND HARD FOR THE CONTRACTORS TO GRASP. THE COMMON QUESTION, ASKED BY THE POPULOUS, IS WHAT DOES THE SHAPE REPRESENT? I EXPLAINED A DYNAMIC TROPICAL THRUST UPWARD INDICATING A NEW TIME OF LIBERTY FOR THE PRESS. PEOPLE JUST SHAKE THEIR HEADS BEWILDERED, BECAUSE THEY HAVE DIFFICULTY RELATING TO OBJECTS THAT ARE ABSTRACT. THE OBJECTIVE WAS A BEAUTY OF MOTION AND FORM BRINGING DIRECT JOY. THE CONCEPT WAS TO HAVE THE ROOT LIKE WALLS, THAT GRAB THE LANDSCAPE, SOAR UPWARD OUT OF A GREEN LAWN. THE LAWN OFFERING MAXIMUM VIEWING FOR MOTORISTS AND EXPOSING THE FORMS. 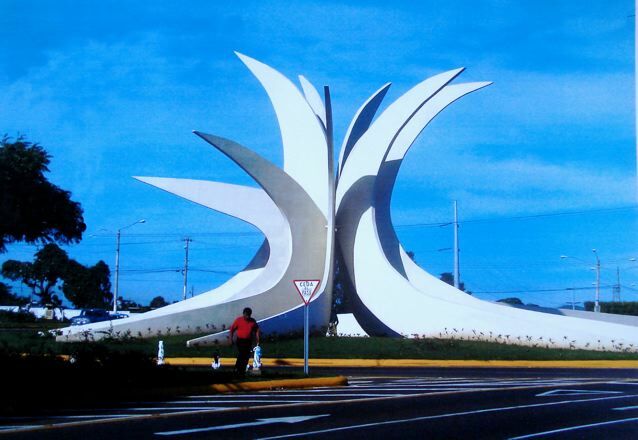 DRIVING FROM A DISTANCE VIEWING THE CRASS CITYSCAPE OF MANAGUA ONE SEES ,IN THE MIDDLE OF THE ROTUNDA INTERSECTION , THIS VIBRANT UPLIFTING FORM. I GET EXCITED EVERY TIME. IT THRILLS ME AND BRINGS DELIGHT. IT DOES THE JOB. THE JOURNALISTS LOVE IT. IT IS A DESTINATION POINT AND GATHERING PLACE, GREAT FOR DEMONSTRATIONS. I AM AWAITING FOR AN ENLIGHTENED JOURNALIST ADMIRER TO RESTORE IT TO ITS ORIGINAL BEAUTY. Glen, I agree that it would be better in concrete. The spiral shape and /exploding/springing form again is a composite primitive expressive form of multiples. The single bent curves are grouped. They are what seedlings start as, or larvae, or worms. The energy is potential, and forward looking. The bio-forms are what give your designs their organic appearance, the composition their dynamic, the site and context describe and characterize your ethics. THANKS ERIK FOR THE COMMENTS. THIS DESIGN WAS A SLEEPER, BUT IT REALLY WORKS. ALL THAT UPLIFTING STUFF IS DRAMATIC IN REAL LIFE. Undoubtely, this structure has a close resemblance with the one designed for the master from Brazil but it if we look at it closely , we can notice the evident morphology of the pineapple fruit expressed in a clean and upward explosion of its members; expressing friendship, unity, freedom. Well thought out idea and a clean expression of the same. I am currently busy with compiling a research and PhD study in the subject of psychology of architecture at the University of Koblenz, Germany. The study is analyzing workplace environment. 1.) How does the surrounding of the workplace contribute and influence the wellbeing and efficiency of the user? 2.) Which aspects are of importance for you, personally, regarding the appearance of the workplace? 3.) Which impact does the appearance of the workplace have regarding communication aspects? questionnaire. If your time permits, may I kindly ask you to forward the link of the questionnaire to your colleagues and friends? I would be very grateful for this extraordinary assistance. Thank you very much indeed. It takes approximately about 20 minutes to answer the questionnaire. Please do not hesitate to contact me, should you have further questions, I am happy to answer your email. In advance, I would like to thank you for your time and support. Kind regards around the world.